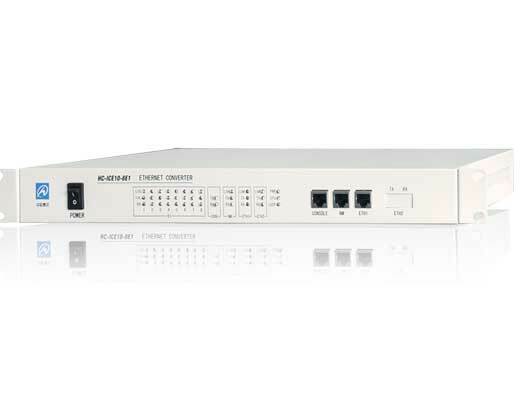 HC-ICE10-8E1 is a high performance and self-learning converter for connecting fast Ethernet LANs over multiple bonded E1/G.703 circuits. It can transmit data through 1 to 8 E1 path. Ideally, when there are some E1 paths break down, HC-ICE10-8E1 can still work normally. It applies to video transmission, LAN connection, TV conference, Internet connection, etc. HC-ICE10-8E1 has two kinds of type, the card and the box. Generally the cards are inserted in our 6U rack at the center side. They can be managed by the management software HCView at the center office. Provide 8 E1 WAN interfaces.